Above: Marie is full of praise for Save the Children’s Cash for Work program. It means her family can buy the essentials they need to survive until they can return to their home on Ambae island. Photo credit: Save the Children. In August 2018, mother of two, Marie Toa, fled her Ambae Island in Vanuatu for the second time in a year as the Monaro volcano continued to spill ash and threatened to erupt. Marie and her family evacuated to nearby Maweo island. After three months on Maewo, families like Marie’s are running out of cash. They are increasingly struggling to purchase necessities, such as hygiene products and food. Making money is not easy. “This is not our land - how can we earn money?” asks Marie. Back in Ambae, Marie and her family were dependent on their garden and the communal resources they shared for food and income. They do not have access to these same resources while waiting to return home. Above: An Ambae resident who evacuate to nearby Maewo island to escape intense ash that continues to be spilled from the Monaro volcano on Ambae receives cash through the Cash for Work program. 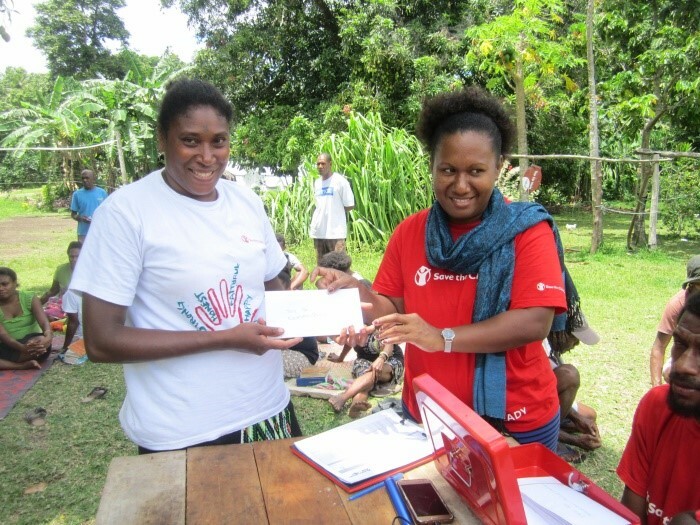 In October 2018, Marie participated in a DFAT-funded Cash for Work (CFW) program facilitated by Save the Children in Maewo. The CFW program provides 900 host and evacuee households with a much-needed cash injection which allow families to supplement existing emergency food and non-food item distributions with any additional items that their households may urgently need. Members of the host communities worked alongside evacuees to identify projects that the entire community could benefit from under the CFW program. ’You know how Mamas worry about things, especially when we feel we cannot do anything to provide for our children? We talk a lot about hygiene in our family. We are lucky to have running water, but we also need soap to keep us clean and healthy. We have not been able to afford that. During Save the Children’s Cash for Work program, we worked together with our host households to establish communal gardens next to our settlement site. We really enjoyed the week of working together, not just because we earned money to provide for our families, but we got to share ideas and experiences with our host community,” said Marie. ‘I speak for all the mamas in Maewo when I say thank you to Save the Children for helping mothers to pay for what their children need in this time of difficulty,” she concluded.